If you have decided that your current website does not strive to fulfill the purpose that it was created for you must go for a re-designing of the website. If you are not satisfied with the outcomes of the website, then perhaps there is an ever increasing need to come up with something bigger and better. Analysing the Analytics: Analytics refers to all kinds of data pertaining to your website. Which part of your site has been viewed more than the others, a geographical profile of your web audience, which features have attracted greater attention? The data acquired after an in-depth analysis will help you realise what features need to be kept intact and what to change. It will also help you gain a fair idea of your viewers so that you can keep their preferences in mind while going for a complete overhaul. Content Management System: This mechanism widely known as CMS is a way of ensuring the kind of content that goes on your site and how is it managed. While redesigning your website you might want to choose from the widely available CMS. Certain things that CMS helps you choose is the user interface so as to determine the ease of use by the users, an editing mechanism to ensure that the content can be edited easily in case a correction or an addition is required. Also a code which is search engine optimised to bring more and more people to your website. 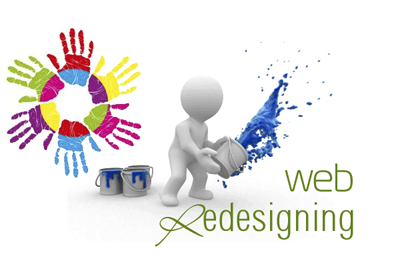 Choosing the Right Design: Quite certainly, every redesign process aims to change the way a website looks. Thus, it becomes important to choose the right font, cases, text styles, backdrops, colours etc all this time over to give it a refreshing feel. The style of the website must be in keeping with its ethos. Our website redesigning services ensure that you get a great deal and the newly constructed site fulfils your aspirations and helps you flourish.